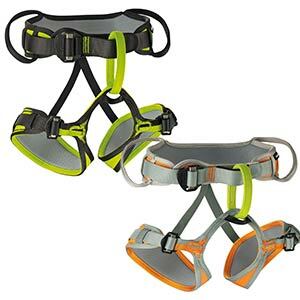 The Edelrid Finn II Harness is a fully adjustable children’s harness that is excellent value for money. It has 3D mesh padding for optimal support and comfort, and easy Glider buckles for a secure and comfortable fit. The 3-buckle construction allows full flexibility and keeps the tie-in point centred and the gear loops aligned, and it features 2 robust gear loops for additional safety.